Click here to see a live online demo of the neural network forensic stylometry model described in this article. In 2013 JK Rowling, the author of the Harry Potter series, published a new detective novel under the pen name Robert Galbraith. She wanted to publish a book without the hype resulting from the success of the Harry Potter books. However, following a tip-off received by a journalist on Twitter, two professors of computational linguistics showed that JK Rowling was highly likely to be the author of the new detective novel. How did they manage to do this? Needless to say, the crime novel is set in a strictly non-magical world, and superficially it has little in common with the famous wizarding series. One of the professors involved in the analysis said that he calculates a “fingerprint” of all the authors he’s interested in, which shows the typical patterns in that author’s works. What’s my linguistic fingerprint? Subconsciously we tend to favour some word patterns over others. Is your salad fork “on” the left of the plate, or “to” the left of the plate? Do you favour long words, or short words? By comparing the fingerprint of a mystery novel to the fingerprints of some known authors it’s possible to get a match. 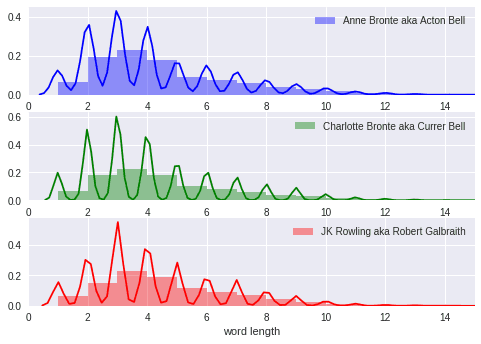 Identifying the author of a text is a field of computational linguistics called forensic stylometry. With the advent of ‘deep learning’ software and computing power, forensic stylometry has become much easier. You don’t need to define the recipe for your fingerprint anymore, you just need lots of data. My favourite way of approaching this problem is a Convolutional Neural Network, which is a deep learning technique that was developed for recognising photos but works very well for natural language! If you have a business problem in this area and you’d like some help developing and deploying, or just some consulting advice, please get in touch with me via the contact form. On 5th July 2018 I will be running a workshop on forensic stylometry aimed at beginners and programmers, at the Digital Humanities Summer School at Oxford University. You can sign up here: http://www.dhoxss.net/from-text-to-tech. Update: click here to download the presentation from the workshop.